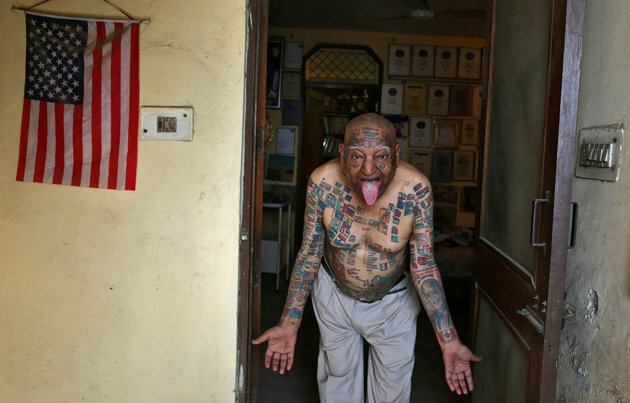 NEW DELHI, May 26 (Reuters) – An Indian man obsessed with setting Guinness world records got 366 flags tattooed on his body and had all his teeth removed so he could put nearly 500 drinking straws and more than 50 burning candles in his mouth. 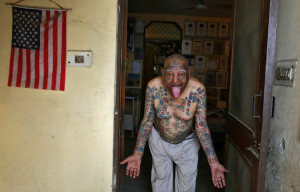 Guinness Rishi, 74, multiple world record holder including most flags tattooed on his body, poses for a photograph outside his apartment in New Delhi, India May 20, 2016. REUTERS/Cathal McNaughton TPX IMAGES OF THE DAY from New Delhi to San Francisco and gulping a bottle of tomato ketchup in less than four minutes.